The end of summer Labor Day holiday is fast approaching. In this last week of august 2018 the S&P 500 and tech-heavy NASDAQ have both made new all-time highs. As reported in various financial sources, this may (or may not) be the longest bull market in U.S. history. 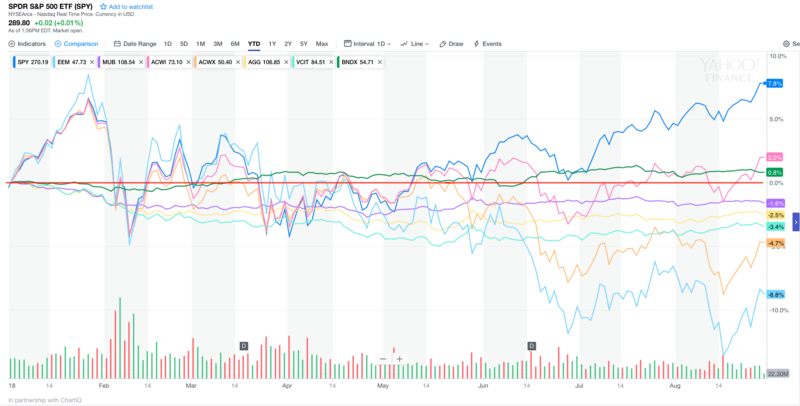 The dispute centers around previous bull markets and whether they were properly measured as commencing from various near 20% declines….20% being the arbitrary definition of a “bear” market. What is not disputed is that from the March 2009 low of 666, the S&P 500 has grown fourfold over the past nine-and-a-half years and now trades near 2,900. The index has racked up an average annual return of 16.5% over that stretch, not including dividends, driven by strong corporate profits, low inflation stable (official) economic growth and gobs of central bank stimulus. These conditions will not obtain forever. The Economist reports that the price-to-earnings ratio of the S&P 500 is 25 and on a cyclically adjusted basis, even higher. History informs us that future market returns from these lofty valuations tend to be quite muted, even negative. Furthermore, much of what has driven corporate earning growth comes under the heading of “financial engineering.” Offshoring of jobs, wage suppression, union busting, cost shifting (healthcare and pensions) onto employees and stock buybacks are not long-term drivers of sustainable profit growth. Ultimately, organic corporate growth driven by broadly distributed income growth will be necessary to drive markets sustainably higher. While the warning bells are not ringing that the U.S. stock market is poised for a serious tumble, truth is that bells never ring. It might just be that markets meander sideways or underperform for the next ten years or so. What is unavoidable however is that markets strongly tend to revert to their average longer term returns and that this current market is quite ahead of long-term averages. What we can do as responsible stewards of client assets is to shift client portfolios away from the clearly overvalued and into the relatively inexpensive asset classes. The timing will never be perfect…it can’t be and it is ultimately unimportant in the long-term scheme of portfolio outcomes. But in the short term, it can sometimes appear to be premature. 2018 is a case in point. We have been tweaking our client portfolios…away from long-only U.S. equities towards more hedged U.S. equity exposure and towards higher dividend paying exposures for a bird in the hand kind of portfolio defense. Outside the U.S. markets we have been increasing exposure in the emerging markets, which have better long-term growth prospects and significantly lower valuations. Just as slow growth and high valuations in the U.S. markets portend subpar returns, better growth and lower valuation in emerging markets offer the potential for better returns—over the long-term. See the exhibit from J.P. Morgan Asset Management below. So far in 2018, that tweak has not been rewarded. Through midday today (August 28, 2018) the S&P 500 has gained 8.0% for the year to date (YTD). The emerging markets index has declined by the same amount. An equal blend of these two exposures would have no return for the YTD, excluding dividends. On top of that, U.S. muni bonds are negative 1.5% YTD, U.S. Intermediate -Term corporate bonds are negative 3.4% and the MSCI All-Country World Index (excluding the US) is negative 4.5% YTD. As a result, a broadly diversified and globally balanced asset allocation has gained little ground for the year. Income and dividends earned by these exposures will add measurably to the results. But, despite the record setting U.S. equity markets and headlines, properly allocated portfolios won't have much to crow about.